Dog boarding community DogVacay has been updated on iOS devices, giving dog owners new abilities to keep track of their animals while away from home. The app allows users to find local pet sitters to take care of their dogs when they’re away, and one of the app’s newest features, VacayCam, gives those owners a new tool for checking in on their furry friends back home. VacayCam allows pet “hosts” to take pictures of animals and send them to their owners. 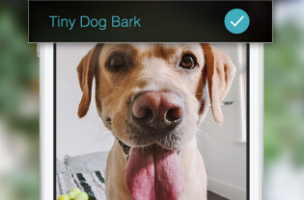 When taking a picture, the app emits a sound, such as a bark, meow or squeak, which (in theory) attracts the dog’s attention and creates a better end picture. These photos can be edited with stickers, frames and text, and DogVacay Hosts can send the finished products to the dog’s owners, or post them to Facebook, Twitter or Instagram. In addition to VacayCam, this DogVacay update has introduced other new features to pet owners. A vet finder helps users locate nearby animal hospitals and veterinarians, while a symptom checker helps users identify existing issues within their own animals, or those they’re “dog-sitting.” Elsewhere, users can access a new tips and tricks section of the app, containing help and advice in multiple categories, from dog training and keeping dogs healthy to the best places to take your dog in a specific city (like Los Angeles). Since its formation, DogVacay has booked more than half a million pet-sitting encounters, and has gathered a community of over 15,000 hosts across the US and Canada. Within the app, users can browse local pet sitters, read reviews about their past experiences, schedule meet-and-greets or contact potential hosts for more information. The app advertises prices that are, on average, half that of local kennels for pet boarding services. The DogVacay app is available to download for free on iOS.